This morning we had cereal with bananas, coffee, and juice for breakfast. Vanesa prepared some coconut flesh in lemon juice and sprinkled it with nutmeg. Craig was not feeling well this morning. After his initial flu-like symptoms, he had felt progressively better for a couple of days. But since our visit to Antigua, it had been all downhill. Over the past couple of days, the two red splotches on his arms which we had attributed to the sulfur baths had turned into red splotches all over his body. And his joints were in tremendous pain. These symptoms, coupled with the fever and headache from earlier in the week, are consistent with when I was diagnosed with Lyme disease in 2005. Could this be Lyme disease? Craig had done some yard work in the woods behind our house prior to the trip, and though he checked himself thoroughly for ticks afterwards, it is possible that he was bitten and didn't know it. His symptoms started as we were leaving Boston, so it wasn't something that he contracted here in Guatemala. He was trying to save up what little energy he had for tomorrow's journey home. Air travel is stressful in the best possible conditions, but when you are feeling very ill it can be a downright nightmare. Our plan was to focus on getting him home, and then take him to the doctor on Monday. Being the weekend, Tyson and I were trying to think positively that the shop that sold the carved dog might finally be open again. We planned a mission to Calle Santander to seek it out. Craig asked me to keep an eye out for a machete. It is an ubiquitous tool down here, and one that he had always wanted. Tyson and I walked up Rancho Grande. It occurred to me that we should try stopping at a hardware store. I knew that there were several ferreterias (hardware stores) if we turned right at the Dispensa Familiar. We went into the first one we came across, and the man kindly directed me to the machete display. There were a variety of sizes of commercially made, plastic-handled machetes. I wasn't certain about shape or size, so I decided to shop around more. We went into a second hardware store. The machetes were from the same manufacturer, and cost the same as in the first store. I found one I liked for 35 Quetzales ($5) and purchased it. They handed it to me and I walked out of the store. Tyson asked if I wanted to drop it off at home so I didn't have to carry it around town with me. I told him that I didn't mind carrying it; in fact I felt like a badass. He wisely opted to walk on my left side, since I was holding the machete in my right hand. We walked the length of Calle Santander in search of the wooden dog. We went into every shop which was open. It was Saturday, the big tourist day in town. Surely the shop would be open today. But no luck. We then decided to photograph every shop which was closed. There were only 4 of them on the whole road, so it must be one of them. That way we would know where to look on subsequent missions. A woman called out to me, asking if I needed a leather sheath for my machete. Why yes, I could use something like that. That's the kind of entrepreneurship I like...seeing an obvious need and trying to fill it. As opposed to the 75 people per day trying to sell me random textiles. 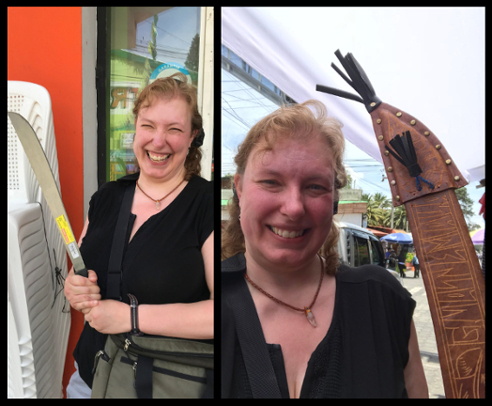 We went to her booth and found a sheath which fit my machete. It was way more expensive that the machete itself, but it was utilitarian and made it look even more badass. She also sold other leather goods, and Tyson bought a colorful collar for Roxy. As we passed the place where Tyson had bought empanadas yesterday, he was feeling a bit peckish. There were no empanadas in the case ("empanada with the emphasis on the nada," to quote Craig in a similar situation), but Tyson asked about them. He was told that it would take about 15 minutes for them to make a batch. It was way too hot in the sun to wait around. I did, however, catch the attention of a local man..."Nice machete!" Just then, the guy selling the Woody Woodpecker whistles from yesterday appeared. Dear God, don't let him follow us again! We made a quick getaway. Tyson had been wanting to try Guatemalan fried chicken since we arrived in the country. In Guatemala City, Pollo Campero restaurants are as commonplace as Dunkin Donuts in Boston. There is pretty much one on every block. And they even deliver! There is one at the airport, and we had told Tyson that we usually eat there on our way home. Except that last year, the airport had been so crowded and slow that we hadn't had time to eat lunch despite arriving 3 hours before our flight! Thing weren't all going to plan on this trip: the road closure which meant that we had to substitute a roadside sulfur bathhouse in place of the cloudforest grotto Fuentes Georginas, and the fact that Tyson wanted to buy the carved wooden dog...not only couldn't we find it, we couldn't even find the store! It was like the Twilight Zone. If we counted on having time to eat at Pollo Campero at the airport, I feared that something would happen to make that impossible, and Tyson wouldn't get to try Guatemalan fried chicken. To try to prevent this, I suggested that we have a snack at the Pollo Campero in Panajachel. Tyson was hungry, and it was right down the street. We went into the air conditioned restaurant. There was a huge table of missionaries eating there. Luckily there was a table for 2 free. I didn't want to a very big meal, so I got some chicken tenders, fries, honey mustard, a roll, and an orange soda. Tyson ordered a 3 piece extra crispy meal with fries, a roll, and cole slaw. My food came out almost immediately, but they told Tyson that his would be at least another 15 minutes. Damn you, extra crispy! After Tyson was finally able to eat his food, we walked back home. I presented Craig with his machete. He was psyched, and agreed that the leather sheath really added to the mystique. He dreamed about how he was going to use it in our back yard...once we figured out a safe way to stow it in our checked luggage! I posted about Craig's condition on Facebook, indicating that we were confident that he had Lyme disease, and that we would take him to the doctor on Monday when we were back home. Several people commented that they strongly believed that we should get him antibiotics as soon as possible so that symptoms would not progress further. Though we were wary of what our doctor might think about over-the-counter Guatemalan antibiotics, we knew that our friends were right. My dad has chronic Lyme disease due to the fact that he went undiagnosed for so long. It is now something that he has to deal with for the rest of his life. Lyme disease is nothing to mess around with. My friend Max was the one who really convinced us, and we are grateful. I looked up Lyme disease on the CDC web site. It recommends 100 mg of Doxycycline twice a day for 10 days to 3 weeks. That was the same antibiotic they had given me in 2005, and I remember that I felt so much better immediately after taking it. Also, we knew that blood tests for Lyme take a while, and doctors in the U.S. will often prescribe Doxyxycline in the meantime while waiting for test results to come back. There didn't seem to be much to lose and there was plenty to gain. So I walked down Rancho Grande to the Cruz Verde (Green Cross) pharmacy. I asked for Doxycyclina. The pharmacist was very helpful. Apparently they have two kinds, one of which is for staph. After I explained the situation and showed him the CDC site on my phone, he gave me the non-staph kind, which was imported from Europe. The pills required no prescription, and cost $1 apiece. I purchased a supple of pills, thanked the pharmacist for his help, and walked back to the house. Calle Santander was deserted; everyone was inside watching the World Cup. When I got back to the house, we gave Craig his first pill immediately. For lunch we had tiny green pumpkin-shaped squash stuffed with hamburg and veggies, with melted cheese and a red sauce on top. It was delicious! The family is always coming up with delicious meals, and we are so grateful for their hospitality! We spent the afternoon packing to go home tomorrow. Craig carefully protected the machete in our checked luggage. Tyson took one last walk to see if the store selling the dog might open for the evening, but he had no luck. Tonight we had been invited to Estudio Juan Franklin for Rocio and Hector's son Mael David's first birthday party. As much as Craig wanted to go, he was not feeling any better after his first dose of antibiotics. He wasn't sure what the party would entail (or how far away it was), and needed to save whatever strength he had for traveling home tomorrow. Humberto was still working when it came time to leave for the party. The party started at 7 p.m., and we left the house shortly after that time. I joked with Paulina about it being Chapin (Guatemalan) time. We walked over with her, Eddy, Aracely, and Ian Ivan. Ian soon became cranky, and when Paulina picked him up he fell right asleep. At 7:30, we arrived at the venue, an upstairs function hall which had been decorated with balloons and a photo collage shaped like the number 1. There was a large cake with blue and teal frosting. Mael David's name was piped on the top with the same thin red icing as Cristian's cake had. This was just as difficult to read, due to the texture of the frosting. The only people there so far were Humberto's niece Blanca, her mother Priscila, and daughter Dulce. We said hello and chatted with them. I explained that Craig was not feeling well, and introduced them to Tyson. We soon saw Humberto's sister Juana with the birthday boy Mael David. It was hard to believe that he is a year old already; we had seen him as a newborn. Juana seems so happy in her new role as grandmother. We wish the family nothing but the best! We sat at a table toward the back. The centerpiece contained a balloon and some marshmallow kebabs which had been dipped in icing and sprinkles. We were soon joined by Yoselin, Yasmin, and Josue. Rocio greeted us and thanked us for coming, and I conveyed Craig's regrets. More familiar faces appeared: Humberto's brother Mario, his son Daniel and wife Ingrid, and their kids Brittany and Angel David. Humberto's nephew Victor arrived with his wife Rosa and kids Andrik and Neli. Victor's brother Juan Carlos arrived with wife Yolanda and kids Junior and Fatima. We kept expecting Humberto to arrive at any moment; it was unusual for him to be this late from work. We hoped that everything was ok.
Dulce came over and introduced me to her cousins. She kept finding excuses to stop by our table to say hello. Her sweet temperament and the attention that she seeks from me is very reminiscent of her brother David, who passed away at four years old before she was born. He and I had a special connection. He was always so sweet to me, always trying to get my attention, smiling up at me with adoring doe eyes. Her behavior is so similar, despite the fact that I spent much more time with David than I ever have with Dulce. I can't help but think that he is there with her in spirit, encouraging her to seek me out. Ian Ivan woke up and started to play with the balloon in the centerpiece. Everyone was welcomed to the party and some prayers were said for Mael David. They had some games for kids and adults, but honestly from where we were sitting, we couldn't see what was going on. We entertained ourselves by playing volleyball with our centerpiece balloon, until it sailed over to the next table. Soon it was past 9 p.m. Tyson was tired, and we would have to get up early for our trip home tomorrow. We were both very hungry, and Craig was at home with an empty belly. As much as we wanted to stay for the rest of the festivities (food and cake), we had to start making our way home. We thanked Rocio and Juana and said our goodnights. As we walked home via a bustling Saturday night Calle Santander, we looked for somewhere that we could get some takeout food to share with Craig once we got back to the house. We decided to get cheeseburgers and fries at Taqueria los Chileros. The lady said it would take around 15 or 20 minutes. That was fine with us; it meant it would be fresh. So we sat at the bar chatting while they prepared our food. We walked home with our burgers, and ran into Humberto in the alleyway. He had just gotten home from work, and had checked on Craig. Craig had explained about the Lyme disease and the antibiotics. Humberto had been planning to run over to the party to join us, but now that we were home, he decided to take a well-deserved rest. He had essentially done back to back tours today, only getting home at 9:30 p.m. I went to get Craig, and we sat outside on the patio to eat our burgers and fries. They really hit the spot. We chatted with Humberto for a while, and decided to retire. It would be an early morning. The family arrived home from the party at around 11 p.m., by which point we were already in bed. The only way to get Ian Ivan to smile for a posed photo is to tickle him!